All businesses, even the most successful ones, will have unsatisfied customers every once in a while. But most of unhappy customers actually never bother to complain. They simply leave and switch to competitors without even letting you know when and how your company failed to meet their expectations. On the bright side, statistics says that 95% of those who complain, are ready to give you a second chance, if you manage to handle their initial complaint successfully and in a timely manner. So how to do it effectively and turn every complaint into a positive customer experience to win those customers over for life? The key to successfully dealing with complaints is in the right attitude towards them. As simple as that. In fact, customer complaints should be embraced and seen as unsolicited feedback which is always a valuable source of information about your business. Customers don’t complain just to be rude or upset you. They do it because they’ve experienced a problem with your products, services or the way your business operates, and they’re simply telling you about it. Why not use this customer feedback as an incredible opportunity for learning where your business could be improved? 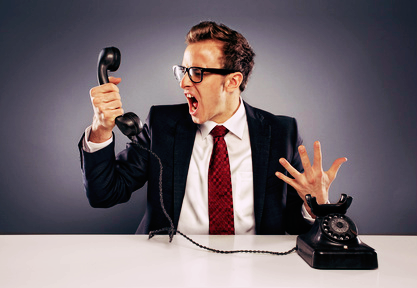 Here’s 6 tips to keep in mind whenever you get a complaining customer. Make sure that everyone who complains on the phone, live chat, social media or by email gets a rapid response. Even if you cannot provide an immediate solution to their problem, you can at least let them know that their complaint is heard, taken into account and that you’re going to do your best to make things right as soon possible. No matter how angry or even rude the customer might be, you need to remain calm and listen without interrupting. While it’s the most natural reaction to get defensive when attacked, ‘winning’ a confrontation is not going to help you in any way. Let them speak and express their frustration without taking it personally and losing your cool. After letting them talk, take the lead and start asking questions to get as many details as needed to really understand the situation and the problem. It is important, though, that you avoid sounding too scripted and drop the formalities. Use this opportunity to start a genuine conversation and build a trusting relationship with a customer. If your company really made a mistake, admit it, acknowledge the problem and take responsibility for helping a customer to solve it. I believe that it also makes a perfect sense to apologize. Saying sorry doesn’t necessarily mean that you are personally taking the blame. It’s more about showing compassion and understanding of their feelings and frustration with the situation. Now that you know all the facts and a real problem behind a customer’s complaint, it’s time to offer a helpful solution. If you can’t do that, pass the issue over to someone who can. If you are able to get things right quickly and effectively without letting them wait for ages, you’ll get a happy and, most probably, a loyal customer. No matter how unpleasant the situation was, when customers complain (even if they do it in a less-than-desirable way), you still need to be thankful in the end. Once the solution is provided, thank the customer for bringing the complaint to your attention and giving your business an opportunity to improve. That is also how you let them feel important and valuable. Knowing how and being able to resolve customer complaints successfully is no doubt essential to your business success. But what’s even more important is whether you learn from those situations and how you use that knowledge to minimize customer complaints in future. In other words, just do whatever needs to be done – improve your product, fix the process, train stuff or whatever it is. On top of that, be honest with your customers about your products or services in the first place, don’t give them false promises to avoid unrealistic expectations and disappointment. How do you deal with customer complaints? Feel free share your success stories below. This entry was posted in Articles, Best Practice, Instructions, Tips and Tricks and tagged complaining customers, complaints handling, customer complaints, customer service, customer support, handle customer complaints. Bookmark the permalink. Resolve a complaint in the customer’s favor and they will do business with you again 70% of the time. Up to 95% of customers will give you a second chance if you handle their complaint successfully and in a timely manner. Thanks Kanchana, that statistics is really inspiring. thanx very much with this inspiring words, it will really help me . If a customer complains they want to give you a second chance. How you handle the complaint says a lot about you and your company. Anyone can be good when there are no problems. Listening to the customer is very important. Sometimes they just want to vent so let them do it and then take quick corrective action. Thank you Douglas, agree with you, the way we handle customer complaints says a lot about our businesses. Responding to all complaints helps us to understand our customers. Our attitude towards the complaint and staying professional it important. Improving good listening skills and thanking the person for bringing this to my attention helps in finding a solution. Being in property management it is important to promptly answer email, voice mail and written complaints. There have been some tension filed emergency phone calls, which I am glad to say have been turned around by our listening (and note taking) of important issues a tenant brought to our corporate office. Remember to address the person by their name, verifying their contact information, and asking questions, then following up with a thank you always makes a difference. I have had the complainant call me back and thank me for listening, and apologized for being out of control. Stay professional! Thank you Mary, excellent summing up: the right attitude, staying professional, listening, asking questions, responding and thanking. This is the way we should all deal with customer complaints. I for one do not support the apologetic method I find it counterproductive. It has never worked well for me in all my years of providing support. I prefer the idea of being empathetic NOT apologetic. Identifying with the customers issue and developing a sort of alignment and interest in resolving the issue is more productive. I NEVER apologize. I take ownership of the solution not responsibility for the problem. This empowers you and puts you and the customer on the same team. Here is what we can do to fix this issue. A brief explanation of what the issue is if you know as well as some helpful information about how to do something beneficial on the computer as small talk. Like I notice you have a lot of pop ups I can show how to disable them while we work on this other issue. Often those in the company who do not actually handle the customer offer suggestions about how to deal with a confrontational and unhappy customer think the apology “method” is helpful as someone who picks up the phone and has for several years I can tell you it is not. This is a back seat driver approach. It shows a total disconnect with the customer service agent. This is another reason for high burn out and turn over in customer service. Leaving your “front line” support powerless and apologizing often makes the customer feel more frustrated and hostile. It leads towards a customer feeling like they have the “culprit” so to speak or I have been informed they don’t want an apology they want a solution. It is easy to suggest something like apologize when you are NOT the one having to apologize upwards of 40 times a day… This does not help a technician cope with the pressures of an unhappy customers or lend to making them better customer support people. Customers can tell if you are sorry about their issue they don’t care. But they do care about your showing you are invested in solution. Anyone can be distant and repeat over and over again in a flat monotone voice some standard company mantra. Aligning yourself with your customer and the issue they have works tons better than patronizing them with empty apologies.